Your workout history is always safe with your RunHelper Connect. Every time you complete a workout or edit a journal entry your changes are automatically uploaded to your RunHelper Connect account. No more worrying about accidentally deleting a Journal entry or losing your workout history when you upgrade your phone. 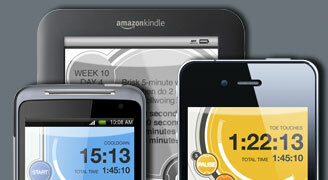 All your workout history from all Bluefin apps at one place. How many miles did you log last month? Is your average pace increasing or decreasing? How many hours have you worked out last week? Get answers to all these questions with a simple glance at your RunHelper Connect home page. RunHelper Connect is all about keeping you accountable and helping you stay on track with your training. So, every Monday morning you will receive an email with a beautiful graph giving you a snapshot of your workouts from the previous week. See how many miles you logged, calories burned, and pounds shed right in your Inbox. RunHelper Connect makes it easy to share your workout stats with friends. If you choose to share your workout pages (they are kept private by default) you can easily post them on Facebook, Twitter and other social media sites. Print your workout history and take it with you when you meet with your healthcare provider. Satisfy your inner statistician by exporting all your workout history in CSV, then use any analytics software you wish. Want to plot your route in Google Earth? You can do that by exporting a GPX file of your workout. Your workout history is yours and we believe it should stay that way. Paying for a RunHelper subscription means that we don't have to support the service with advertisements. We will never sell your data to advertisers. RunHelper subscriptions are exclusive to customers working out with Bluefin apps. To join download one of our apps from the App Store, then purchase a subscription using an in-app purchase. Three, six and twelve month subscriptions are available starting as low as $4.99. Now available for iOS apps. Android support coming soon.